IMDR - Institute of Management Development and Research, Pune. Pioneers in Management Education since 1974. The full-time PGDM programme requires a graduation, with or without experience. Thus, PGDM is primarily an entry-level qualification for a management career. This is Initial Education which provides the conceptual structure of the organised body of knowledge in any new field of activity. Non-formal learning, in the industry context, takes place in part through Induction and In-service Training in industry (either in employment or in own business). Induction helps to interpret `actual practice' in terms of the concepts acquired in initial education. In-service training helps in acquiring specific job-related skills leading to taking up independent responsibilities in the system. However, non-formal and formal learning are linked together in lifelong learning, when an individual in industry re-visits formal learning periodically, for updating his knowledge in a systematic manner. This entire process is represented in the diagram below. The curriculum of PGDM, at IMDR is designed as Initial Education leading to an entry level qualification for a management career. The curriculum charts out the course of study for PGDM. In order to understand the curriculum, the overall approach of IMDR towards its educational activities must first be understood. This approach has been formulated in the Mission Statement, which is a part of the Institutional Purpose (Sec. 2). The curriculum aims at achieving certain objectives as a part of the process of preparing the student to be a professional (Sec. 3). These objectives help in identifying the major curriculum areas which make up the structure of the curriculum (Sec. 4). The individual subjects form part of one major curriculum area. The content outline of each subject thus is linked to the overall objectives of the programme in the context of the particular approach adopted by the Institute towards its educational activities. IMDR is committed to the kind of Management Education which contributes to enlightened management practice and sustained growth of work organisations. We help our students to become thoughtful and sensitive professionals with a commitment to simultaneously contributing to the environment and the self. Our teaching should assimilate all progressive trends both in management practice and management thought with a view to addressing issues in Indian management. The Institute must establish relatedness with industry in India to help in integrating and enriching theory and practice in the field of management through research, training and consultancy. The Institute must create and maintain dialogue with academicians from other disciplines and practitioners from non-business organisationsso as to enrich the field of management thought. The institutional purpose captures the conviction that a professional manager should address not only his/her self-development and role in an organisation, but also the role in society at large. The curriculum facilitates the `Professional in the Making' by focusing on the roles at the Individual, Organisational and Societal level. In sum, the programme would prepare students to become thoughtful and sensitive professionals who participate actively in the organisational processes towards achieving sustained growth of work organisations. Individuals joining the PGDM course come with certain abilities, attitudes and values, in addition to their formal qualifications. This is the student `Input' to the process. The curricular, co-curricular and extra-curricular activities in the duration of the PGDM course result in the `Transformation' process that facilitates the professional in the making (`Output'). 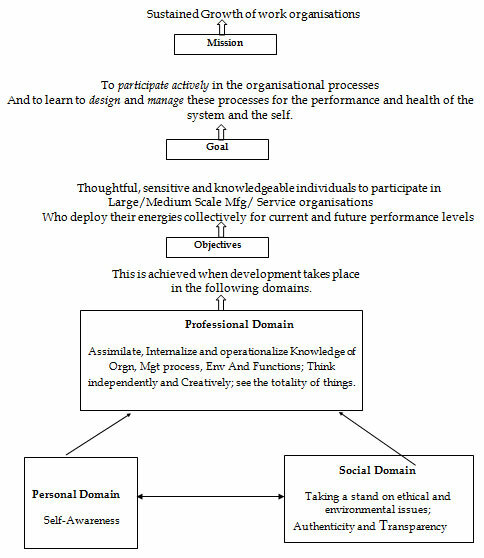 The course aims to strengthen in the individual (i) the ability of on-going learning (Individual purpose), (ii) the ability to manage a system (Organisational purpose), and (iii) an awareness of his/ her social contribution (Societal purpose). The specific objectives of the curriculum are spelt out in the following section. Learning to learn as an aid to life-long continuing education. Taking responsibility for own career path. The student, on completing the course of study at IMDR, should be able to develop a career plan on the basis of his career needs. In the life-long learning concept, the student will have to continue to learn throughout his working life to keep himself adaptable to changes that happen in the industry every few years. Thus, the individual must acquire `learning to learn' skill; a generic skill independent of any subject matter. An ability to maintain physical and mental health, and a moral and aesthetic sense, are desirable in the aspiring professional. An awareness of the organisation as a system. Applying knowledge base in all functional areas, with core skills in the elective functional area. Applying a knowledge base, of corporate management principles and practices. Applying a knowledge base of Environment interfaces. The fulfillment of these objectives will help the individual to understand organizations as an open system. S/he will have a thorough grounding in basic management practices, communication skills, and information processing and control techniques. Importantly, the student as a professional would be able to operate from the application of a knowledge-base. Ability to take a stand on Ethical and Environmental issues. A sense of responsibility towards contributing to social progress and development. Ability to act with integrity within and towards others. The structure of the curriculum, to be delivered over the two year PGDM course, aims at meeting these objectives. Management is an inter-disciplinary, applied field which draws heavily on principles, concepts and terminologies from other disciplines. An understanding of these subjects provides the professional with a foundation of scientifically valid & tested concepts and principles, and mode of scientific enquiry for arriving at valid management knowledge and gaining an awareness of the consequences of one's actions. We call these the basic disciplines. These basic disciplines thus form the `Foundation' of management and are included in the first semester. There are certain `Core' processes within the organization at the system and sub-system level that require basic approach of thinking in terms of People, Resources, Decisions and Organisation. Wherever we perceive something as Management, we find processes going on in terms of people choosing and using resources in an organised manner to achieve definite objectives. Subjects dealing with such processes are included in the second semester. The knowledge for decision making and problem solving are derived from `Applied' subjects, which are classified as `Functional' and `Integrative' applied subjects. The functional subjects help students to understand processes at the sub-systems level, dealing with line functions of Operations and Marketing. Additionally, sub-systems that provide resources to line sub-systems are also covered e.g. Finance, Human Resources and Information Systems. The integrative subjects enable students to look at all aspects of management & the whole organization system, to enable corporate strategies to be devised. Forces outside the direct control of the organisation, but having an impact on the workings of the organisation, are categorised as `Environmental' subjects. At this level, issues relating to the individual outside the organisation are also included. Fig. below gives the schematic layout of the curriculum, classified into the categories outlined above. While the classification is necessary to facilitate delivery, integration is achieved by each subject drawing inputs from preceding subjects, while providing outputs to succeeding subjects. It helps the student to gain an overall perspective of the field of management, as also to develop detailed understanding and core skills in a chosen area. It helps to show the interrelationship amongst the building blocks of the curriculum. It helps to emphasize the concept of reinforcement by specific emphasis on inputs from other subjects and outputs to other subjects. It facilitates transfer from knowledge to practice. The PGDM course is concerned about Work Organisations in the economic sector. These organisations function as a part of the socio-economic environment. They draw material, human and financial resources from their environment and organise them in some durable arrangement. With the help of these resources, the work organisation then transforms raw materials and inputs into finished goods/ outputs. The organisation exchanges the outputs with the market and begins a fresh cycle of input, process and output. At the primary level, management is concerned with maintaining a stable working pattern. This pattern consists of people, work, organisation and exchange with the environment. People interact with one another in some structured way in the organisation and produce not only output but also behavioural phenomena such as satisfaction, morale, conflict and culture. Some of these behavioural phenomena arise within the individuals, others in groups of individuals and yet others encompass the whole organisation. But the individual is also a part of her community and the society at large, and she plays her roles in these larger systems while taking in the impact of socio-cultural phenomena. The issues outlined above are discussed using a conceptual framework, which has been developed in two basic disciplines: `Psychology' and `Sociology'. A subsidiary discipline `Communication Theory' is also brought into play. Psychology, Sociology and Communication Theory thus form the Foundation subjects where students learn to distinguish and recognise social, psychological and behavioural aspects of organisational realities, and to understand the basic concepts and principles which constitute the `language' for thinking about real life problems. The second aspect of a stable working pattern consists of work. Work in organisationscan be seen asutilisingorganisational resources for procurement of inputs, conversion and exchange of output with the environment. The whole chain is carried out with the objective of maximising the value of output and minimizing the costs of inputs and process. This objective leads to certain logic of decision-making in the functional areas of Operations and Manufacturing, Marketing, Finance, Human Resources and International Trade. Thus the first requirement for a student of Management is to be able to distinguish, recognise and describe the rational and behavioural aspects of organisational reality. The basic disciplines covered in the Foundation are intended to equip the student with the `language' for thinking about the organisational reality. The teaching and learning of a disciplinary subject in a curriculum for professional education must differ from teaching and learning in a disciplinary curriculum. The subject, if taught as a part of the discipline, would cover not only the concepts and their linkages in the form of principles, but would also go into the depth of the validity and precision of the concepts and principles. `In-depth' would be the watchword in the disciplinary approach of a specialist. In an applied course, we approach it with a view to its value in illuminating/uncovering the (otherwise) invisible aspects of reality. `Insight' (into reality) would have to be the watchword. One way of achieving this insight would be to constantly juxtapose a layperson's view and explanation of a situation with that of a psychologist, sociologist, economist or an accountant. Keeping the focus on organisational reality would perhaps help students in appreciating the value of basic disciplines. To appreciate the value of the basic discipline and its contribution to applied fields. To understand the fundamental concepts and to be able to use them in describing situations. At the Foundation level, students are introduced to the inter-disciplinary nature of Management Studies through basic concepts, principles and modes of enquiry in the basic disciplines. This knowledge would help them in understanding the Core Processes taking place in the organisation. Organisations are entities in which people interact to utilize resources for converting inputs into outputs. Organisations import inputs and resources from the environment and export outputs to the environment. Designing, implementing and evaluating programmes of activities: `Management Processes', 'Information systems'. The core processes in an organisation deal with activities which have a diverse character and content e.g. Production, Materials, Marketing, Selling, etc. These activities are operations at a concrete level, while processes are series of connections or methods of operations, at an abstract level. Decisions also have different levels e.g. operational, resource allocation, system-environment interface, etc. This diversity in activities and decision levels is to be integrated by the core process of management, which needs to take an organization-wide view of activities and decisions. The Foundation courses prepare the students for the understanding of Rational and Behavioural aspects of organisations. The Core courses cover the basic processes of organisations in terms of people, activities, information and environment. develop an organisational perspective of all activities, tasks and decisions in theorganisation. understand how people interact and communicate to perform tasks in the organisation. explain organisational phenomena with the help of concepts relating to behaviour, tasks,decision-making and environment. analyse situations in terms of organisational phenomena concerning people, tasks,information and environment. Predict consequences of different possible courses of action with the help of concepts relating to organisational processes, and in the context of ethical considerations. In addition, we will study the particular content of each function and decision-making processes peculiar to that function. Copyright © IMDR Institute of Management Development and Research.